This article is about the band. For other uses, see Terrorvision (disambiguation). Terrorvision are an English rock band. They were formed in 1987 (originally as The Spoilt Bratz) in Keighley, and initially disbanded in 2001. The band used Bradford as a base after the name change to Terrorvision in 1991, by which time the band members had all moved there. The re-release of their second single, "My House" (from the album Formaldehyde), in January 1994 proved to be Terrorvision's breakthrough to UK Singles Chart success, and preceded by months the release of their second album How to Make Friends and Influence People in April 1994. The leading single from that album, "Oblivion", was also a chart success. All subsequent singles achieved Top 40 entries in the UK, culminating in the release of "Tequila", which reached number 2. A video compilation, Fired Up and Lairy, was released in April 1995, and included spoof documentary segments interspersed with all the band's videos to date. A third album, Regular Urban Survivors, followed in March 1996, and spawned four singles; "Perseverance" (their first Top 5 single, peaking at number 5), "Celebrity Hit List", "Bad Actress" and "Easy". Lead singer, Tony Wright, presented the BBC TV music show Top of the Pops on one occasion, and made several appearances on the comedy music quiz Never Mind the Buzzcocks. The band's fourth album, Shaving Peaches, appeared in October 1998. The album's first single, "Josephine", had been well-received the previous month, but it was a Mint Royale remix of "Tequila" which was to prove to be their biggest-ever hit, reaching number 2 in the UK chart in January 1999. That year the song was awarded Best Single at the Kerrang! Awards. The choice was a controversial one among fans. The band originally put a selection of their potential single releases to members of their official fan club, who voted in favour of "Day After Day". However, the remixed version of "Tequila" gained favour with BBC Radio 1 DJ Zoë Ball, who championed its release as a single. Plans to release "Day After Day" were hastily shelved, and a video quickly shot, for the "Tequila" release. A few promo copies of the "Day After Day" single still exist. Thus, despite having their greatest hit in 1999 with the track, they were dropped by their record label, EMI, after the release of the album's third single, "III Wishes". It was the band's first single to fall outside the UK Top 40 since the release of "My House", six years earlier. During this time the band recruited a fifth member, Josephine Ellul, who played keyboards and sang backing vocals at concerts. The band signed to a smaller label, Papillon and put out a fifth studio album, Good to Go, in 2001. The record, like all their others, was also credited to 'Total Vegas', the band's own independent imprint. A number of singles followed, but the band was unable to replicate their previous success. Their final single, "Fists of Fury", gained some notoriety for its video, which aped the cowboy-themed clip accompanying Madonna's single, "Don't Tell Me". EMI issued Whales and Dolphins, a greatest hits collection in 2001, and the band decided to call it a day, after a farewell tour. The 'final' concert took place at Penningtons nightclub in their hometown of Bradford, on 4 October 2001, and was released with an interview DVD as a live album, Take the Money & Run - The Final Concert. After splitting up, singer Tony Wright formed Laika Dog as well as working as a dry stone waller; guitarist Mark Yates joined firstly the short-lived Boston Crabs and then formed Blunderbuss, releasing one album to date, Relentless, and then formed another new band, Badwolf; whilst Leigh Marklew formed Malibu Stacey who released one album On Heat before splitting up. Josephine Ellul now manages UK Rock/Indie band Us Wolves and sings for Midlands based Covers Band 'Hard Drive' and in an acoustic Duo called 'James & Jo Duo'. Mark Yates now plays guitar in rock band Boomville alongside Ben Moran, former bass player with Leeds Band Little Black Hearts. The group reformed to play two tours in 2005, and played what was described as their 'last ever show' at Rock In The Castle in Scarborough, Yorkshire, on 17 September 2005, as Special Guests of The Wildhearts. A collection of b-sides and rarities was also issued by EMI in September 2005. Terrorvision then played three dates in November 2007 in Manchester, Holmfirth and Sheffield. Danny Lambert, the singer in Yates' band Blunderbuss, which was by then inactive, stood in on bass for an unavailable Marklew for these three shows. This was followed by a homecoming show at the Victoria Hall in Saltaire in December 2007 and a new tour in 2008 entitled the '4 Days in May Tour' in Nottingham, Bristol, London Shepherd's Bush and Norwich UEA, this time with a returned Marklew. They also played three dates over Easter 2009 to commemorate the 15th anniversary of the release of How to Make Friends and Influence People, at the Manchester Academy, Wolverhampton's Wulfrun Hall, and the Shepherd's Bush Empire, London. The gigs at Manchester Academy and Shepherd's Bush Empire offered limited edition live recordings of the shows through Concert Live. A similar tour took place in December 2009. On 4 December 2009, Terrorvision played at Hard Rock Hell 3. They returned again in 2010, and began working on a new record. Shutty, their original drummer, left at this stage after 20 years playing with the band and was replaced by Cameron Greenwood. Terrorvision headlined on the Bohemia Stage at the 2010 Sonisphere festival at Knebworth House. Terrorvision also performed in Holmfirth, Bristol, Cardiff and Bolton in July 2010. On 13 January 2011, singer Tony Wright announced on Facebook that they would be releasing a new album in 2011, and would be going on a UK tour to support it. The tour was to start in Newcastle on 24 February. The new album, Super Delux, was duly released on 24 February 2011 to generally positive reviews. Terrorvision will return again in 2016, for a five date arena tour of the UK supporting UK rockers Thunder. Bassist Leigh Marklew said, "We were discussing the idea of getting back in the ring in 2016 – when the call came from Thunder the timing was perfect. We agreed it would be a great way to come back." Terrorvision have covered many songs, often as B-sides to their singles. Covers included "Wishing Well" by Free and "Surrender" by Cheap Trick. Other covers include "Bring Your Daughter... to the Slaughter" by Iron Maiden with a jazz flavour, performed in a Radio One live session, and more recently covered "Oh My God" live during their 'Lost Weekend' 2007 tour, with stand-in bassist Danny Lambert performing lead vocals. They have also covered 5ive's "Keep on Movin'" and David Bowie's "Moonage Daydream". ^ a b c d e f Strong, Martin C. (2000). The Great Rock Discography (5th ed.). Edinburgh: Mojo Books. pp. 978–979. ISBN 1-84195-017-3. ^ a b c Roberts, David (2006). British Hit Singles & Albums (19th ed.). London: Guinness World Records Limited. pp. 553–554. ISBN 1-904994-10-5. ^ "Thunder to tour with Terrorvision, King King". Retrieved 2015-09-26. ^ "ChartArchive - Terrorvision". Archive.is. Retrieved 2014-04-23. 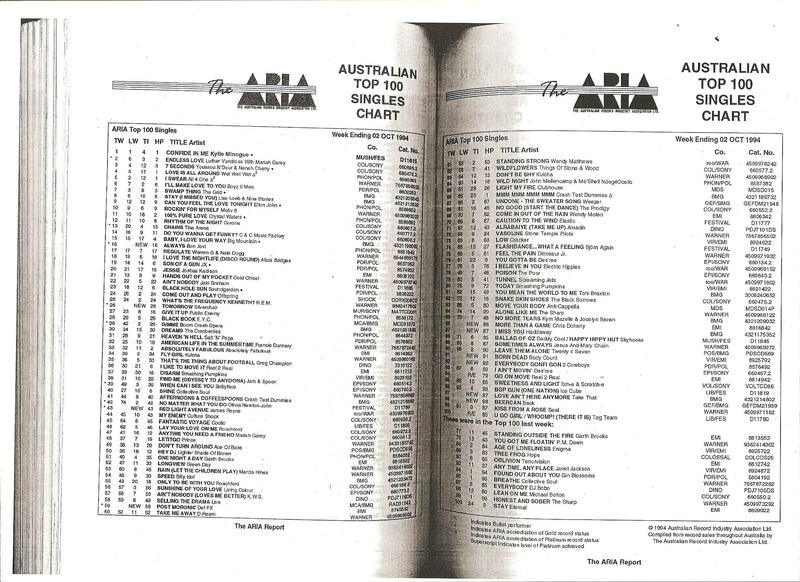 "Oblivion": "The ARIA Australian Top 100 Singles Chart – Week Ending 02 October 1994". ARIA. Retrieved 2016-02-29. ^ Jaclyn Ward - Fireball Media Ltd. - http://www.fireballmedia.ie (1962-10-01). "The Irish Charts - All there is to know". Irishcharts.ie. Retrieved 2014-04-23. This page was last modified on 6 October 2016, at 14:27.